The authors you trust. Now with a whole new interactive experience. 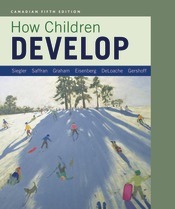 How Children Develop continues to be the topically arranged textbook that teachers and researchers trust for the most up to date perspectives on the field of child development. The book has also been fully adapted for a Canadian audience with special attention to Canadian research and topics of special relevance, offering Canadian readers an organic and engaging reading experience. This edition is also more interactive than ever before with a full suite of media for students to learn and practice the material in the LaunchPad course space. In addition to the full eBook, students have access to the book’s celebrated video program, the LearningCurve adaptive quizzing system with a personalized study plan, and other activities.